Going away this summer? Here’s how to pack the perfect wardrobe that will fit neatly into your carry-on bag! I know the idea sounds crazy, but it can be done. You can in fact fit two weeks of outfits into a carry-on bag. Summer is just around the corner and many people are planning their summer vacations to warm beaches or sight-seeing in a big city. Whether you are hitting the road or flying internationally (like I am), it is important to know how to build outfits. This will allow you to ride comfortably in your car or dodge baggage fees while making everything you need to bring to look fabulous fit into a carry-on sized bag! Make packing for your summer excursion easy this year. Check out how I will be packing for my visit to Europe this summer! In creating an outfit, the basics are your foundation. You start with the basics and you build from there. Basics are clothing pieces everyone has, or should have, in their wardrobe. If you don’t have them, they are worth the investment as these pieces can be mixed and matched with many other pieces in your wardrobe. Your basics are the pieces in your wardrobe that never go out of style. These include clothes like t-shirts, cardigans, a little black dress or a pair of skinny jeans. It is also important to remember that the basics are typically solid, neutral colors such as black, white, gray or beige. These colors make it easy to pair with bright, loud colors or patterns. The basics for my trip to Europe may be a bit different from someone going to the beach. For instance, at the beach, a black bathing suit bottom mixed with 2 or 3 different color tops along with a white cover-up is a must! 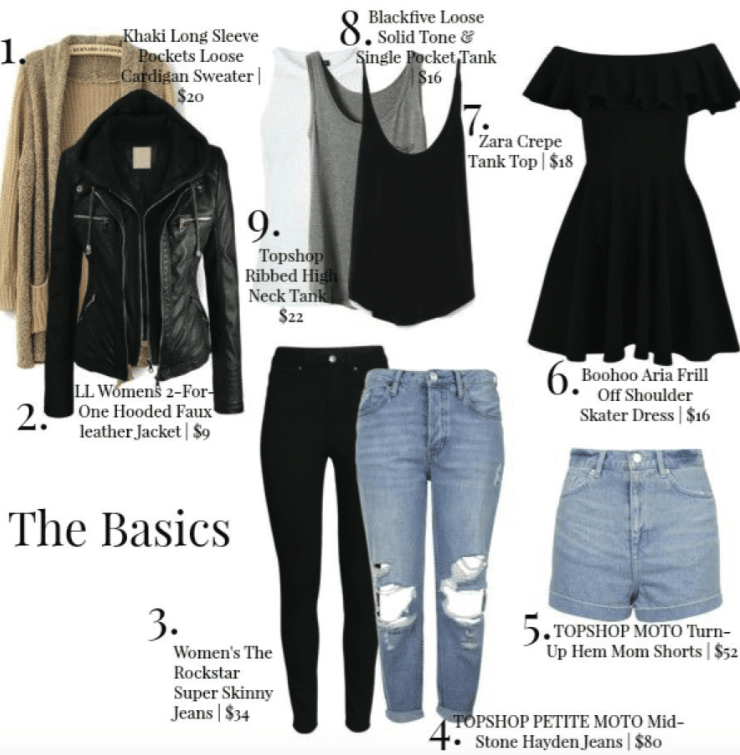 Take a look at my list of basics and you will get the gist! The basics I am packing in my carry-on include three neutral colored tank tops, a pair of boyfriend cut jeans – perfect for rolling up on warmer days or wearing rolled down for cooler days, a pair of black leggings comfy enough for the plane ride, a pair of jean shorts and a little black dress. I decided to stick with pants because the weather in the UK is not as warm as the weather during the summer at home. I also threw in the flowy black dress to add a chic yet summery vibe to my wardrobe. I don’t know about you, but this dress looks super Parisian Chic to me! This cottony dress can also easily double as a circle skirt if you fold the top down which means you have more outfit choices! I also packed some outerwear since it rains often in the UK. These include a beige cardigan and a black faux leather zip up with a hood. It is really important to bring a jacket with a hood because it may be sunny and clear in the morning and then rain like crazy in the afternoon. Use one of these pieces to keep you warm on the plane or in the car and save room in your suitcase for some brighter pieces! After the basics, you then have the freedom to pick something that represents you and your personal style! This is where you want to be adding color and patterns to your ensemble! Perhaps add a fun, floral skirt, a bright pink blazer or a camouflage, cargo jacket. Whatever your choice, make it reflect who you are! My pieces of interest are inspired by European fashion. The striped black and white shirt and floral kimono add texture and depth to many of the basic pieces I packed while the bright yellow shirt adds a pop of color to my wardrobe. I can very easily dress these pieces up or down depending on where I am going that day. 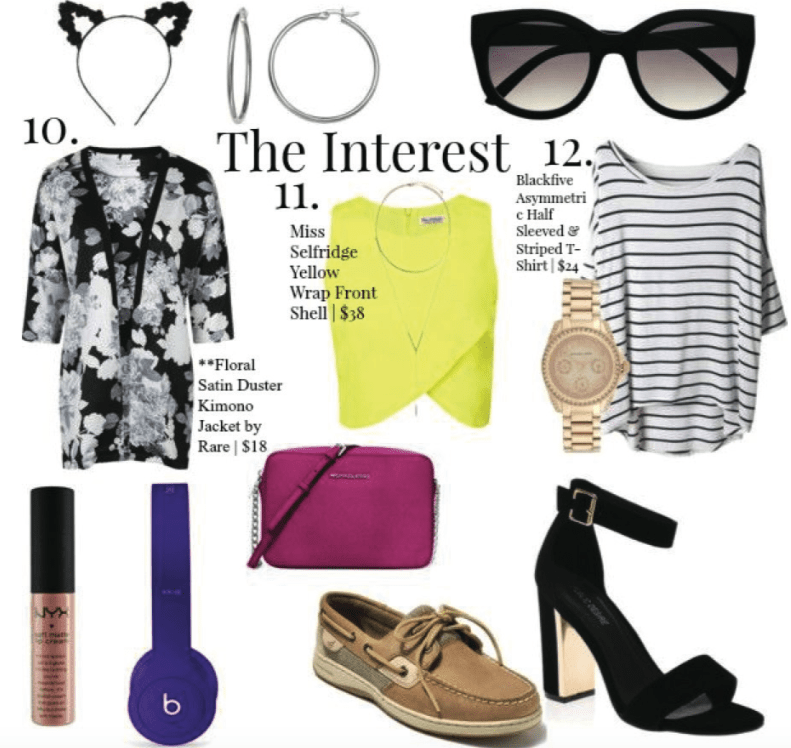 The patterns and colors I chose directly reflect my personal style, so let your personal style shine through these interest pieces! One of the best ways to pull an outfit together is by adding a little bit of bling! I typically consider myself an earring type of girl…I sure do love my hoops! But I also love a simple chain or a dainty pendant necklace. Large statement necklaces are also very chic this spring, so don’t hesitate to go bold! I’ve also decided to throw in a bright bag to add yet more color to the wardrobe. I love these cross body bags, they’re so easy and convenient! I also love accessorizing with sunglasses and I hate squinting (causes wrinkles!) so those are also a must! Don’t forget comfortable walking shoes along with a comfy pair of heels for evenings. Now, you are ready to get your sight-seeing on! Step back now and watch the magic happen! You have so many outfit possibilities and so many different and creative ways to be fabulous! So whether you are flying to another country this summer or taking a road trip to a local beach, make packing easy this summer!